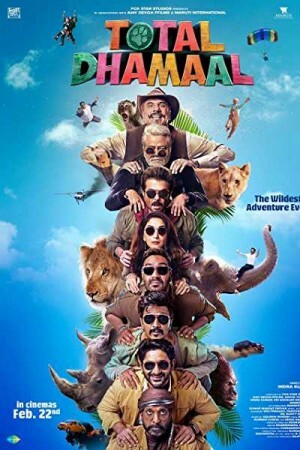 Total Dhamaal is an Indian adventure action comedy movie that revolves around an action-packed treasure hunt mixed with comedy and adventure. 6 people including the loot’s mastermind, 2 dumb-witted siblings, a greedy police officer, and a bickering couple on the hunt for the loot are vied by some seasoned conmen. Though all are desperate to get their hands on the money and this leads to a number of quarrels and fights among the group, will anyone of them get to hit the jackpot? If yes, who takes the money home forms the rest of the story. The movie is the 3rd instalment of the Dhamaal film series.